This week’s episode of The Adelaide Show comes from India to you, courtesy of Kapil and Jo Gupta from the India To You restaurant in Rostrevor. We will soon learn about Kapil’s commitment to his craft and Jo’s wow-factor ability to make guests feel welcome. This week, the SA Drink Of The Week is from Q Wines in the Coonawarra. In IS IT NEWS, Nigel challenges us on stories about herbs and spices. In 100 Weeks Ago, we hear from the Cancer Council’s Lincoln Size about sunscreen – its usefulness and its myths. And in the musical pilgrimage … Todd will be sharing a new song from Zen Panda. Do I have a radio voice? 2010 Q Shiraz Coonawarra … tasting notes coming Sunday. Let Steve know your favourite moments or segments or guests or songs from The Adelaide Show in 2017 and he’ll not only reference you and them in his summer series of “best of” episodes, but he will also send you a twin pack of Naughty and Nice, limited edition, premium toilet paper from Who Gives A Crap, to thank you for giving a crap. Email [email protected] before Xmas day. I’ve never been to India but I am told it is an experience of sensory overload, which is what I look for when I prepare to tuck into some Indian food. But, sadly, bright expectations become DAHL reality, because I am not sure what I am SAMOSA order for a good combination, and I just TIKKA things off the list and my guests are NAAN too impressed with my selections and they RAITA my efforts poorly. So that’s why we’re here with Kapil from India To You in Rostrevor in the hope he’ll save me from bad banquets and from learning Indian puns by ROT-I. 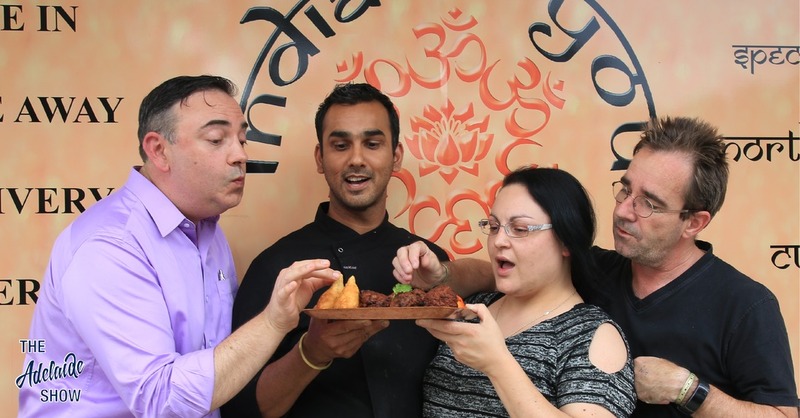 This week's #Adelaide Show comes from #India To You, which is the #Indian #Restaurant in #Rostrevor run by Kapil and Jo Gupta. Great people who LOVE what they do. Lots for #foodies in this one https://t.co/SgRr9alZms Our #podcast even arrives faster than @UberEats! I remember hearing someone up high in BT talk about how it was nothing for him to ask colleagues over at the last minute for a meal because Indian food was easy to share, whereas British culture is all about single serves. How do you view the two different approaches to eating communally? Kapil, I am sure I approach Indian cuisine with a Western mindset and it’s why I can never find the perfect, single dish that has meat and green vegetables and a nice sauce. It’s either all meat, or potato based, or I need to order a heap of side orders of bits of spinach, etc. Can we start with some guidance for approaching an Indian meal? What is a great menu selection I can follow when eating alone vs with friends? How do we approach side dishes? Let’s talk about balancing chilli (heat) and aromatics (flavour). What is the key? I am always surprised when I hear about a new pizza bar or a new Indian restaurant opening because I wonder why we need more. Why did you open India To You? Does it have something to do with your tagline, food with love? Let’s talk about ingredients and production. Firstly, you are shocked that many restaurants by frozen things like Pakoras and just fry them. Is that right? How do you manage your week so you always have stock and India To You? Are there a number of curries that come from the same base? CONDIMENTS AND SPICES FOR – CATTLE. A cattle feeding experiment described by Dr. Voelcker does not encourage stockowners to expect so much from the use of spices and other condimental foods as they are commonly led to believe is possible. As a matter of fact, the recent experiment at Woburn, in so far as it has gone and is capable of useful interpretation, tends to show that wholesome roots and hay, supplemented by, the usual allowances of cake and meal, are as greedily eaten and are more effectual without than with a flavouring material of any kind.. Given, say, 35 lb. of swedes, 11lb. of oat straw chaff, and 3 lb of long hay, with 3 lb. linseed cake and 1 lb. each of decorti cated cotton cake and maize meal (and 40 lb water) per head per day, useful two year-old bullocks will grow and fatten to good advantage without the addition of any of the savoury preparations which inundate the market. Many Asian cooking recipes call for herbs not&#39; normally grown in this State. However, it is only a matter of time before most gardens will have cloves, nutmeg, pepper, and many other herbs which add to the flavour of food and are very easy to grow. The best way to treat most of these herbs is to grow them in a small herb garden where there is a defined area for each particular type and variety. Some are quite attractive when in flower so this little herb garden could easily be a useful feature not necessarily in the back garden. The Way to Spice Food. No other nation uses condiments to the same extent as the Chinese. Compared with the Englishmen, Chinese, in this particular, are far more advanced in refinement and have higher knowledge. An Englishman uses a liberal supply of mustard and pepper, and corrodes his stomach with violent acids, whereas the Chinaman chooses his condiments not only from the point of view of delicacy of flavour, but also from that of therapeutic efficiency, as is shown in the liberal use of ginger, saffron, and other roots of medicinal virtue. He always boils horse radish, black and red pepper, and mustard, thus removing nine-tenths of their fiery properties, and reducing- them to a delicately pungent paste, suitable for all sorts of meat. They cook tomatoes with orange juice and stewed lemon peel, and improve the flavour of insipid fish with boiled lemon peel. We opened the vault to go back 100 weeks to our interview with the Cancer Council’s Lincoln Size. In this snippet, we were discussing the pros and cons of sunscreen. And our song this week is Ego by Zen Panda, selected by our musical curator, Todd Fischer. This week we are featuring a sort of psychedelic, surf-rock track called Ego by local band Zen Panda. I’ve had it on high rotation ever since Radio Adelaide’s Luke Penman named them as one the six hottest Australian bands to listen to early in the year in an article for Tone Deaf. He mentioned that “There’s not many Adelaide bands who’ve sold out Jive for their debut album launch, but Zen Panda did it and absolutely owned the room. If there was an award for Best Front-Person in Australia, Sam Lavers would have it in the bag this year.” I thought that was a pretty glowing endorsement so I had to check them out. I am also a huge fan of the awesome collage-style artwork on their debut self-titled EP which I definitely recommend checking out in full. If you would like to see them live they are playing Swirl Fest at the Ed Castle on the 13th of January alongside some other great South Australian acts including Siamese, It’s a Hoax, Druid Fluids, Neon Tetra and many more. Tickets through Moshtix.